The Waterstones in Portsmouth seemed so lovely and all the staff in there were so friendly and smiley! They really welcomed us and gave us some vouchers to get some lunch in the cafe upstairs. I was delighted to see that they had special Isadora Moon cupcakes up there with swirls of pink icing and bats and wands on them for decoration. 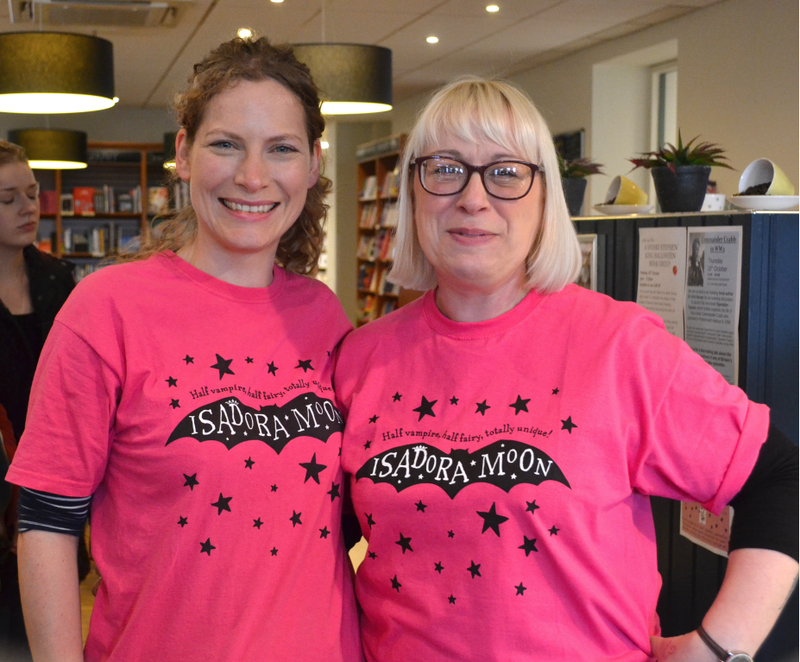 Even the cafe in Waterstones Portsmouth was supporting Isadora Moon with these fabulous cupcakes! Downstairs, the children’s area had beautiful Isadora-themed decorations with iridescent streamers and bunting from the Isadora Moon party pack (get the download link by signing up to my newsletter!). Some of the children who came had dressed up in some really cool Halloween costumes. Here are three of the great costumes I saw at Waterstones Portsmouth… also can anyone else see a ghost behind me? I’m sure there was nothing there when we took the photo! Make your own Isadora Moon vampire or fairy wings at Waterstones Portsmouth – you can download the resource on OUP’s website. The children took these home so they would have time to cut them out neatly, which meant I didn’t get to see any finished ones on the day. However, I did another event later this week at Waddesdon Manor (separate blog post on that coming soon!) where I did actually see a child wearing a pair. They looked fantastic! As with my other ‘autumn tour’ events, I brought along the 3D illustration scene of Isadora Moon’s kitchen. I changed it up this time though by also bringing along a new idea I was trying out: Isadora Moon’s tiniest fan! I was quite pleased with my little doll at first, but then I decided she still wasn’t quite what I envisaged. She may or may not reappear in some form in the future. The miniature book though will definitely stay. It’s the perfect size to go in the Isadora Moon kitchen set – even though it is kind of weird Isadora has a book about herself in her own kitchen! I had a lovely time at my Portsmouth event. It was so nice to meet the children who came and the Waterstones staff. One of them had beautiful purple hair which I loved, but unfortunately I didn’t manage to get a photo with her. The staff at Waterstones Portsmouth were lovely! One other thing I like about events is meeting all the children and hearing all their different names. I have always loved names. When I’m doing book signings, I have to ask for the exact spelling. There are some wild and wonderful variations, spellings and unique names out there! At Portsmouth I met a little girl with the name Seraphina, which i thought was such a beautiful name. I keep lists of potential names for future characters, so that’s definitely one to add. Apart from the Portsmouth event in the last week, I had an absolutely wonderful school visit at Elizabeth Woodville Primary School in Leicestershire. I’ve also had a very busy day at Waddesdon Manor as part of their Horrible Halloween, and just yesterday I was part of the inaugural Hitchin Children’s Book Festival. Each of those deserve their own blog post, so I’ll write those up when my events quieten down a little. For now, the Isadora Moon Autumn Tour is ongoing, with Manchester Waterstones the next stop. You can keep up to date with all my upcoming events on my events page. The Isadora Moon Halloween Costume Competition is still ongoing. You have until 6th November to share your snaps of your best Isadora Moon-themed costume with the hashtag #IsadoraMoon. You can see the full details on my Facebook page.